On tonight’s episode of Here Comes Honey Boo Boo, Mama June lets Jessica and Anna go on a double date with the whole family there to chaperone. Honey Boo Boo’s family ventured to an arcade where Alana and Pumpkin (Lauryn) were sent to watch the two couples during a game of laser tag. “I mean, my biggest concern for the girls, honestly is one of ‘em coming up pregnant,” June Shannon says. June Shannon took Phillip, Jessica’s boyfriend aside for a little talk. “All I gotta say is you better keep your bat and your balls in your pants, your Tic Tac and your Skittle in your pants for a long time,” she says. “I will never go on another date with mama again,” Jessica declares. 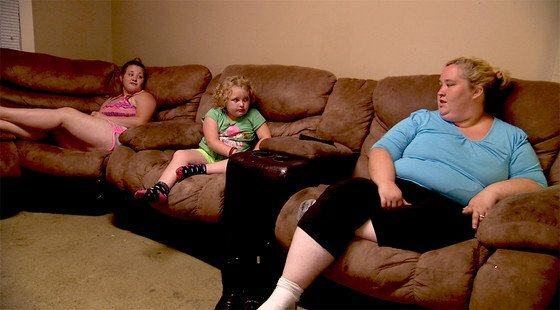 Here Comes Honey Boo Boo airs Thursdays, 9 p.m. on TLC. Ellen DeGeneres and Portia de Rossi divorce?